If you ever had baked chicken with a zesty, tangy, and sweet lemon drizzled over it, you know how your taste buds are tantalized and how mouth-watering delicious it is . With its plump, smooth-skinned, and intoxicating aroma with the slightest breeze whipping through the branches, its no wonder Improved Meyer Lemon is a superstar. Meyer Lemon was originally imported to the U.S. from an area near Peking, China, by the plant explorer Frank N. Meyer of the U.S. Department of Agriculture in 1908. Because of its obvious resemblances to U.S. lemons, it has come to be known as the Meyer Lemon. However, the original Meyer Lemon introductions were carriers of a deadly disease called the Tristeza virus, but the virus free clone developed in the 1950s and released by the University of California in 1975 is known as Improved Meyer Lemon and does not have this issue. Today, what you see at your favorite Green Thumb Nursery is the improved selection. Improved Meyer Lemon is a cross between a lemon and a sweet orange and is a furiously addictive fruit. Unlike the leading commercial variety, Eureka Lemon, Improved Meyer Lemon is more sweet, less acidic, and is slowly graduating into commercial production. Its favor is mild, flesh is juicy, and is useful for flavoring both savory and sweet dishes alike. It is delicious on fish, poultry, vegetables and fruit desserts. This outstanding fruit is loaded with Vitamin C, is low in calories, and the juice is a delicious, fresh alternative to high fat salad dressings and sauces. You can use Improved Meyer Lemon in a myriad of culinary uses with rice, ice cream, cake, tea, water, sandwiches, and the famous lemon meringue pie! In the garden this epicurean delight is moderately vigorous, shrubby, few thorns, and relatively small in size at maturity. Improved Meyer Lemon in the landscape can make an attractive garden tree or be trained on an espalier for areas with limited space. 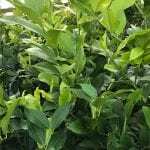 It can be used very effectively with other citrus trees with high density planting techniques such as multiple trees planted in the same hole creating a mini orchard for your home. This species has a rounded growth habit and moderate growth rate of 8 to 10 ft. tall and 12 ft. wide in open ground without pruning. 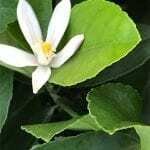 This citrus is very suitable planted in large containers where in ground applications is not available, to limit size, or to easily move the specimen to a warmer location during the winter if you live in a freezing prone area. Improved Meyer Lemon provides year-round interest with its dark green fragrant leaves and decorative/ tasty fruits. In the garden you can combine this plant with: Olive, Pomegranate, Rosemary, Lavender, and Sweet Bay. You can even use this variety as a hedge that needs little or no pruning. Improved Meyer Lemons yield fragrant flowers intermittently throughout the year, but the main season is in the spring. Many times fruit and flower occur simultaneously. Fruit takes about 6-9 months to ripen into a medium-sized, elliptical lemon, with a thin, yellow-orange rind when fully ripe, and requires less heat and cooler summers than other lemons. You can expect it to produce in coastal areas nearly year-round and inland locales November – March. Meyers ripen on the tree only. To determine when to harvest, simply pick the fruit , if it is to your taste , it is ripe. To harvest lemons, it is recommend to cut them off instead of pulling it off from the tree. 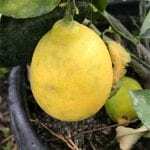 For your Improved Meyer Lemon to thrive in the landscape they need to be planted in a well draining, slightly acidic soil, and prefer to be moist but never soggy or standing water. Never allow water to hit the trunk. This subtropical citrus does best with regular water but can withstand some drought. Water newly planted trees thoroughly twice a week in normal weather, more frequently during hot spells. Established trees should be watered every other week or more often during a heatwave. It is wise to water when the soil is barely moist 12” below the soil surface and water enough to wet the ground slowly 3-4 feet down. It is highly advised to mulch the surface of the soil 2-3 inches or more to help reduce water evaporation. Pruning should be done during spring and early summer for size control and to improve the shape and structure if desired. Your Improved Meyer Lemon likes all day sun, mild temperatures, and proper feeding with fertilizers formulated for citrus. Usually you need to make your feeding during spring, summer, and fall (every 6-8 weeks) with a granular fertilizer. In containers fertilize every month.Use an additional fertilizer that contains Iron, Zinc, Manganese, and Magnesium every 6 months. In the immediate coast it is safe to plant almost year-round, however in inland sites if freezing winter or spring occurs you may need to hold off until later. I encourage you to take a trip to you favorite Green Thumb Nursery and check out these beautiful trees.